The delegates from France, the UK and Belgium collaborate at the United Nations General Assembly to reform the Security Council. They are especially invested in restricting vetoing powers during crisis situations. If a country is under crisis and one of the seats detaining veto powers has a vested interest in denying a resolution to the affected country, then that would be a conflict of interest. The delegate of France and Belgium after an interview regarding the specifics of their resolution (Washington Post). The country with the veto power could push their own political agenda to achieve ulterior motives. This conflict of interest must therefore be addressed and prevented, as proposed by their resolution Tea Club Material. Their intention is to hone the vetoing framework and rectify the inherent unfairness. Belgium gave an example that “If Ukraine is under crisis, then Russia should not be able to veto – it would not be fair”. They sought to distribute the veto power to other countries, extending it to the G4 countries with a potential rotation. Under friendly amendment, they sought to work in an African country as well. The delegate from Cuba suggested South Africa, and was described as “surprisingly forthcoming” by France and Algeria. They were unsure why Cuba had singled out South Africa, and thought it best to confer to the African Union’s judgement. The Post inquired about the procedure in the event that a country’s veto is denied due to conflict of interest. France and Belgium explained that there would be a vote in the committee to elect another country to temporarily preside over the empty vetoing seat. France believed that the “innovative restriction [allows for] every country’s inclusion”. With a greater implication from the international community, it would necessarily yield better solutions than centralized decision-making. The delegation from Russia qualified the resolution as a “power vacuum” and was “perplexed as to why the UK and France would willingly give up their power”. After the amendments were submitted, the Tea Club Material resolution failed with twelve votes for, fifteen votes against, and three abstentions. Pendant la dernière rencontre de l’OIPC concernant le problème de la piraterie maritime, la France a proposé l’utilisation de gardes armées privées pour tenter d’éradiquer la piraterie. La mesure a d’abord été mal reçue par les autres délégations avant de faire l’objet de pourparlers. L’idée de remettre le sort des pays victimes de piraterie maritime entre les mains du secteur privé ne plait pas à tous. Pourtant, la France avance que l’idée connait déjà un certain succès sur son territoire. Une garde privée est en effet responsable de protéger les bateaux de commerce et de croisière. Si les États-Unis sont tout à fait en accord avec l’idée, plusieurs autres pays ont exprimé des réticences. Fidji a soulevé plusieurs questions : qui financerait ces gardes? Sous quelle législation seraient-elles? Quel serait leur but? Le Salvador a précisé que la mesure était trop couteuse et ne visait qu’une solution à court terme. En entrevue au sujet de sa proposition, la déléguée de la France s’est dite surprise du refus de certains pays comme le Yémen et le Royaume-Uni qui possèdent pourtant un système semblable. La France avance également que cela pourrait consister une solution aux problèmes complexes de financement, car « […] de plus en plus, demander du financement n’est pas une solution viable». De son côté, le Royaume-Uni a d’abord rejeté la mesure avant de procéder, lors d’un caucus non modéré, à des pourparlers avec les autres pays. La délégation a alors proposé un modèle de partenariat entre les gouvernements et le secteur privé pour faire la lutte à la piraterie. Plusieurs pays s’inquiètent sans surprise du danger de rendre les pays plus vulnérables trop dépendants des plus riches qui ont la possibilité de constituer des gardes privées. Ce point a notamment été soulevé par le Yémen. In the United Nations Office for Outer Space Affairs (UNOOSA), all the delegates are discussing the alien satellite that will soon hit South Africa. Russia, Korea, Germany and USA are trying to convince the committee that we should send a rocket or an explosive device to stop the satellite. They think there is a way to solve the problem of radioactive or some other things that will hurt the health of people in South Africa and places nearby. China wants to send a net to stop the satellite, so that it will not be harmful to the world. However, there are possibility that the net may fail as it does not have the 100 percent rate of success. So, it is wise to have plan B to remove the people living in South Africa in case of the net failure. At last, they are agreed to let the satellite hit the South Africa, the picture below shows the final time of South Africa and all the delegates are moaning for them. We believe that South Africa is going to be great again after the disaster and rebuild the family. As the UNGA debates on a reform of the Security Council, various actors have expressed their wishes for a wider range of representation within the UNSC. During the last sessions of the UNGA, Canada, Mexico, South Korea, Columbia and many other countries were working together on a draft resolution which would make the UNSC more inclusive. In the mean time, other countries preferred to focus on either the veto power or the role of the delegates; the group has preferred to concentrate on the regional representations. Latin America would have three seats. Concerning the veto power, when questioned about it, Colombia stated that they don’t plan on changing it, but simply to add one more seat for an African country, again aiming for a more inclusive Security Council. “Countries are really willing to discuss for real” said Donald Tusk, President of the European Commission, sponsoring that resolution. On the other hand, he insists that “[they] want [their] resolution to pass in front of the Security Council” and therefore that the modifications suggested must not be too radical on the UNSC. He was also surprised that “countries like China, the UK and France were so amendable on their veto power”, on their own resolution draft. The resolutions that have been presented today would be the first major reform to this structure in its 70 years of existence. Although there was only little time left, the UNHCR moves into its second topic. Today there are thousands of Rohingya people displaced from their country because Myanmar’s military has been persecuting them for their beliefs. Myanmar refuses to acknowledge that there is a crisis. The delegation of Myanmar had this to say: “We are running a counter insurgency measure within our borders. There is no crisis to begin with,” and “we need to keep in mind that the Rohingya are Bengali immigrants”. Myanmar also wishes for countries to send their help to Bangladesh instead. Other countries have stated their concern for the Rohingya, and their desire to help out. The United Kingdom stated, “it is important to actively see an end to the Rohingya crisis”. Other countries believe that Myanmar has the right to deny citizenships to the Rohingya people despite the fact that they have been there since before Myanmar was even a country. The delegate of Belgium after an interview (Washington Post). The United Nations General Assembly debating the reforms for the Security Council was divided in its first and second committee. The United Nations Charter does not explicitly allude to the 5 permanent seats’ vetoing power over resolutions. Member States have been pushing for a fairer distribution of this power. Somalia emphasized the necessity for more transparency regarding the P5 countries’ veto powers. Somalia recognized the Security Council’s historical interventions, nevertheless seeking a more equitable representation. The delegate of the Federal Republic of Somalia told the Post that “China does not represent us”, referring to the over-representation of Western powers through Russia, France, the United Kingdom and the United States of America. At the first committee session, the United Kingdom claimed that it earned the right to keep its veto because they used it well in the past. The Somalia expressed their discomfort with this statement, as it was unclear what that premise entailed. Britain has had a history of colonialism that must be taken into account. Yesterday, the delegate of Hungary affirmed that hidden vetoes enable bullying. In a brief interview, Belgium said “secrecy allows for honesty”. The delegate believed that if everybody was granted vetoing authority, then there would be no freedom of speech. Belgium was concerned that with total transparency, the possibility of passing judgements over other Member States’ opinions would hinder the unrestrained negotiations. Though Belgium’s premises lead to the conclusion that decisions made in secrecy are optimal, they maintained that they were open to working with everyone. The delegate of New Zealand was shocked over Belgium’s claims. New Zealand said, “Discussions and ultimately decisions of the UNSC affect every nation in the UN; […] the only binding decision making body of the UN is the UNSC. So it is ridiculous and unfair that a small clique (the UNSC) expects full privacy making decisions”. The countries present at the United Nations Security Council unanimously agree on resolving the brutal crisis going on in East Timor, yet no one has proposed concrete solutions. While the Fretilin government is still in power, the population of East Timor continues to suffer. When will the body of the UN security council stop being stagnant and finally take action? Throughout the final hours of the day two committees entered voting procedures on the resolutions presented by the countries in the UNHCR committee members. After a day of hard work pertaining to the solutions for the rising refugee crisis, it all came to that moment. Tensions were heightened as countries got really passionate in defending their draft resolutions. Words were exchanged between the delegation of the United States and Argentina on the matters of education in economics. Despite, tensions, confusion and attempts to delay voting, members managed to get into business and vote on resolutions. 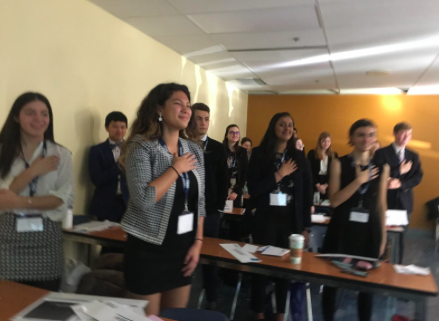 Quite a few resolutions were passed, with the exception of the one the Russian Federation included which empathized with how the acceptance of refugees puts a strain countries’ resources. If it were passed, it would have been a historic resolution as there were partnerships formed with unlikely countries which included North Korea and the United States. Even if there were some resolutions that were not passed many of them did, which is a great thing for all the refugees who need more support in this rising crisis. Last night, American and British forces air raided the capital of the USSR, Moscow. This rose the tension between the Soviet and American delegates to an extremely high degree. Multiple countries have attempted to step in and multiple insults were thrown between the two nations. The countries of Jordan and Canada also voiced their opinion. Canada, as a multiculturalist and Soviet collaborator, said that they welcomed anyone. Jordan, however, rejected the notion of Communism, as it does not mix with Arab nationalism. As of yet, no other actions have been taken by other countries. 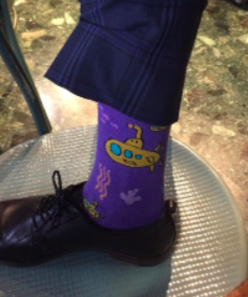 Over the years, the MUN community has gained renown for its crazy socks. I went off and collected a sample in hopes of finding MUNC 2018’s nicest and coolest socks. Even though I did have to get very close to smelly feet to capture the conference’s best socks, I think it is deserving of the delegates’ stylish efforts. Here are the four best socks of this year’s 2018 MUNC conference. If your socks weren’t featured in the article and you think that they deserve a better spotlight, don’t hesitate to tweet to @euronewsmunc2018 with the hashtag #MYSOCKSROCK . UNGA : quand ça parle d’inclusion de toutes les régions. L’un des organes constitutifs de l’ONU est l’assemblée générale des Nations Unies (UNGA en anglais) et elle a pour but de surveiller le budget de ce dernier, de nommer le secrétaire général, de formuler des solutions à l’assemblée générale sous formes de recommandations et de nommer les membres non permanents au conseil de sécurité. Dans le comité UNGA, les délégués cherchent ensemble des moyens de réduire le droit de Veto des grandes puissances dans le conseil des Nations Unies, et essayent de voir ensemble comment on peut augmenter les membres permanents et les pays non représentés parce qu’ils comprennent que certains continents sont mis de côté comme : le continent Africain, l’Amérique latine dans le continent Amérique et les Caraïbes. Cette proposition est principalement soutenue par Haïti, le Centre de la République Africaine et la Suède, dans le but d’étudier les possibilités d’orienter et d’ajouter les régions précitées et autres. Selon eux, cela permettrait au droit de Veto et au conseil permanent d’avoir plus de membres et les droits des grandes puissances comme les États-Unis, la Suisse, la France et la Chine pourrait diminuer vis-à-vis de ces pays mis en quarantaine, tout cela dans le but de permettre une échange équitable et transparente entre tous les pays membres. UN Watches Helplessly as Conflict Escalates in East Timor, USA takes things in its own hands. Despite a timed crisis and escalation of the number of troops present in East Timor, the UN is still failing to pass a joint directive to address the crisis. The US is remaining strong, however, and taking things into its own hands. It struck a deal in the 11th hour with Indonesia to fight back the East Timor government, and restore peace and stability to the region, which is going through live. While the US was busy trying to strike a peace deal, Australia, Nigeria, India, and Mexico were busy trying to put taxpayer money into their own pockets by negotiating deals to extract oil from the region while in session at the UN. Rumors were brewing that the USSR and East Timor were plotting to use Weapons of Mass Destruction to fight back in the region. The US successfully talked them out of the crazy plan, however. That’s truly shocking, Sean, and so is this : remember that humanitarian aid ship that was shot down by troops passing as American? Turns out, it was the Fretilin government, in collaboration with the Soviets, that were behind the attack that harmed their own people, a CIA report found. Clearly, the Fretilin government does not have the interest of its own people at heart, and I believe that the US will be successful in restoring democracy in the region. Thank you for that breathtaking revelation, Tucker. Now, the Florida recount : is it a hox? We find out after these quick messages. The UNHCR has entered voting procedures on a resolution towards a Global Compact for Refugees. As the debate on a Global Compact for Refugees is coming to an end in the UNHCR, various draft resolutions are on the floor in the beginning of voting procedures. A first resolution was presented by Argentina, China, Nigeria, South Africa, United Kingdom, and Uruguay, which insisted on the importance of various infrastructure, notably related to employment and education, in order to help the refugees to integrate the community. This resolution has mainly been questioned as it would require a lot of spending from the UN, but finally passed. Another, sponsored by India, Israel, the United States, North Korea and the Russian Federation, “emphasizes the respect of the sovereignty of countries” and “draws attention to the importance to ease pressure on host countries” while not suggesting any short term solutions. This resolution has not passed. Canada, Fiji, Japan and Spain are sponsoring a resolution focussing on the implement of various technologies. This resolution also passed. A fourth draft resolution from Iran, Jordan, Lebanon about finding permanent solutions to ease the pressure on frontline countries is accurate, considering their special position in this issue, as they each give asylum to millions of refugees each, according to UNHCR reports. This resolution passed too. The fifth draft resolution coming from Brazil, Columbia, Pakistan, and Singapore, insisting on the importance of “dividing the responsibility of each country to better the Global Compact on refugees” also passed, perceived by nations as a guideline concerning the treatment of refugees. Two other resolutions are still in the progress of voting at the moment. L’Union Européenne pourrait tirer profit des résolutions adoptées par le bureau des affaires spatiales des nations unies (BASNU). Les délégués ont voté en faveur de quatre résolutions. Les résolutions proposées mettent de l’avant plusieurs idées similaires dont l’éducation, l’élimination des débris spatiaux ainsi que le développement d’un partenariat entre les gouvernements et les organisations privées. En outre, ces recommandations faites par le corps des affaires spatiales des nations unies vont avoir un impact positif sur l’Union Européenne. Les délégués du bloc « Collaboration for the Heritage of Mankind » encouragent les membres à élaborer une campagne visant les étudiants internationaux afin de les encourager à aller étudier dans un domaine relié à l’aérospatial. En effet, des bourses d’études ont été mises en place pour les étudiants qui désirent étudier en sciences spatiales à l’Université de Beijing. Cette bourse sera disponible à tous les étudiants dont ceux européens. Ensuite, le problème international des débris spatiaux qui occupent et obstruent l’atmosphère sera réglé par un effort commun des membres du BASNU. Le bloc « To the Universe and Beyond » a proposé de permettre aux universités reconnues par le comité de permettre à leurs étudiants de développer et d’envoyer des satellites pour éliminer les déchets dans l’atmosphère. Finalement, un partenariat entre les gouvernements et les organisations privées pourraient permettre aux Européens d’obtenir plus de fonds de recherche pour l’espace. Cette décision aurait d’autres impacts positifs dont la création d’emploi de recherche en Europe ainsi qu’un meilleur accès aux bases de recherche. Le bureau des affaires spatiales des nations unies avait un agenda qui semblait chargé au début du weekend, mais les délégués ont su relevé la tache avec brio. The middle east is now in the middle of a crisis, that could potentially lead to an outbreak of war between Iran and Saudi Arabia. The Wahhabis are an extremist Muslim group who are followers of Muhammad Wahhab. They are commonly associated as a sect of the Sunni branch of Islam. The sect originated in Saudi Arabia and the country has been notorious in its funding of the extremist group. “We are exceedingly concerned, because we feel the government of Saudi Arabia is somewhat, in support of these Wahhabis” said Mohammad Reza Pahlavi, commenting on the threat of the Wahhabi hijacked plane headed for the middle east. The sect has been a threat to peace in the region attacking Shia muslim shrines like it did in the holy shrine of Mashhad, Iran. Iran under Pahlavi is an American ally and an important country in the region. Iran is predominantly Shia, what makes the Wahhabis even more likely to attack Iran, since they believe that the Shiites are heretics. Earlier this month an attack in Mashhad claimed dozens of lives, angering Iran and furthermore escalating tensions between Iran and Saudi Arabia leading to a “cold war” between the two countries. If war breaks out between the two countries, the middle eastern region has a whole will be in chaos as they are the two main players controlling the middle east. “We [Iran] would need to begin bringing in troops [in Saudi Arabia] and retaliate in bombing” said Mohammad Reza Pahlavi, responded the Shah when he was asked if any retaliation would be made if the Saudi-backed Wahhabis would crash the plane into a major Iranian city. Cet après-midi, les locaux occupés par la Cour internationale de Justice s’activent : un cas attendu qui a été largement médiatisé est sur le point d’être entendu. Questionné sur ses impressions quant à l’affaire, le Juge Ronny Abraham de la France a réitéré que ce cas « montre la complexité de la loi ». En effet, malgré les lois internationales claires sur le financement du terrorisme, rappelons que la Convention internationale sur le financement du terrorisme a été signée par la Russie, les faits de cette affaire sont si largement contestés qu’il est complexe d’appliquer concrètement la convention. Le Juge Rony Abraham poursuit en expliquant qu’il est « difficile de trouver [dans le cas présent] la vérité ». Il est vrai que depuis le début du conflit, la situation présente deux points de vue opposés qui divergent complètement sur plusieurs des points les plus centraux de la crise. Il revient donc à cette cour, selon les dires du Juge Abraham, de démêler les faits pour établir la vérité et rendre un jugement en conséquence. Même si plusieurs ont accusé la Russie de plusieurs méfaits, les preuves sont constamment réfutées par celle-ci. Lors des déclarations d’ouverture, les désaccords entre les deux parties ne pouvaient pas être plus flagrants. L’Ukraine a rapidement accusé la Fédération de Russie d’avoir violé les obligations auxquelles elle s’est engagée dans la signature de différentes conventions. Le pays qui a proclamé son indépendance face à l’Union soviétique en 1991 avance que la Russie aurait empiété sur la souveraineté de l’État par ses actions en 2013 et 2014. De son côté, la Fédération de Russie croit que les bases sur lesquelles repose l’argumentaire de l’Ukraine sont bien faibles, voire inexistantes. Le pays accusé a mentionné les paroles de son président Vladimir Poutine à de nombreuses reprises lors de son discours d’ouverture pour répéter le discours employé par celui-ci tout au long de la crise. Il y a fort à parier que la défense de la Russie avancera que le cas n’entre pas dans la juridiction de la Cour internationale de Justice. Si l’Ukraine a effleuré le sujet pendant son discours d’ouverture, il sera certainement intéressant d’en entendre davantage dans les futures audiences. Quoi qu’il en soit, il s’agit d’un excellent exemple pour illustrer la complexité de la tâche attribuée à la Cour internationale de Justice. Cette affaire, comme bien d’autres entendues devant cette Cour, montre bien les difficultés reliées au fait de rendre justice à l’échelle mondiale. During this session the spotlight has been mostly moved off of education and onto economy. Many countries have stated their desire to improve on their economy before moving onto other problems. South Sudan who made the session more fun by motioning to play Africa by Toto says that there should be free trade, but only within Africa. Meaning that richer countries would pay for the resources made by poorer ones which would ultimately keep the money in Africa which will improve the economy. Another thing that delegates believe will improve the economy is the reforming of voting procedures, so that more people are voting and being positively affected by elections. By doing that the people can choose leaders who will do what’s best which could affect the economy. All sanity that once may have belonged to anyone in the delegation concerning the once-vital ownership of the Suez has long since departed. Jerusalem has been captured without Israel even knowing. France had a coup and has been overthrown. This leaves a fascist government in its place, and an aircraft full of Wahabis heading in the direction where they can cause the most chaos, causing fear of another 9/11 (It's literally 1956. That event doesn’t exist, so why is everyone worrying). However, in the midst of the chaos, one light sparks in the darkness. Sacred milk, a milk brand created by the countries of Canada, Panama, Indian, and Jordan has just been formed. The Panama Canal ships the Canadian dairy farmed milk out, and it has already become a major success. Canada keeps all the profit from the already multimillion dollar company which will boost Canada’s economy, and therefore ours as well. This just goes to show how even the weirdest events can reap the best results.